The Millennium 3 encompasses a unique combination of True Low Air Loss and intensive alternation therapies. 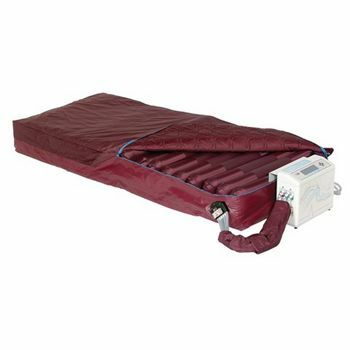 The sophisticated 3-Zone cell system facilitates customised pressure redistribution by divising the patient contact surface into three individually controlled sections of the mattress accommodating the head, torso and legs. The advanced microprocessor control unit is simple to set up and operate and can be customised for any user in any situation to function harmoniously and seamlessly. The control unit constantly monitors and adjusts intracellular pressures to maximise patient comfort. Very high rish anatomical areas can be specifically and effectively targeted by varying pressure in the contact cells to increase therapeutic benefits. This mattress surface is ideal for patients receiving treatment for ulceration, burns, flaps and grafts.